What we are discussing here is not an 0day against Good for Enterprise, but it is a methodology that can be used to inspect the security of the Good for Enterprise environment. 11/10/2011 08:10 AM <DIR> . 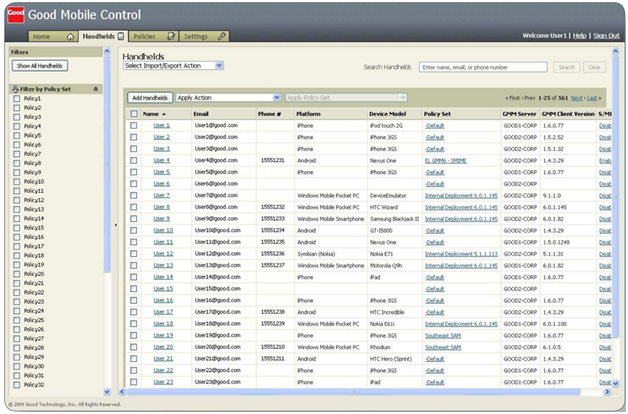 11/10/2011 08:10 AM <DIR> ..
Once logged into the Good Mobile Control interface, you have full power to lock, remotely wipe, and configure new handhelds. “This email address has already been set up on another handheld. Contact your IT administrator” -I hate those error messages—especially if we are the IT administrator. Doh! 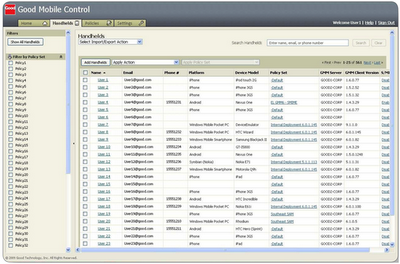 However, you can add a handheld to an already existing user to read their email. Log into Good Mobile Control web interface -> Policies tab -> Provisioning link -> Welcome Email and verify that “Send welcome email after OTA Provisioning PIN is created” is unchecked. Log into Good Mobile Control web interface -> Policies tab -> Check the policy you want to copy and click the button that says “Make Copy”. Now, click on the policy hyperlink -> Provisioning link -> Welcome Email and verify that “Send welcome email after OTA Provisioning PIN is created” is unchecked. Download the Good application from the market the enter the email address of the victim and the OTA pin displayed on the Good Mobile Control page. Are you sure you are the only one reading your email? This Attack Vector looks like it is more geared to a sneaky insider on a lower class Network where the admins are not making use of some basic mitigation techniques or a network where the sysadmin my have unintentionally exposed there GMC to the external internet by allowing forward of port 8443 out through the firewall. Thanks for the feedback. Insider threats are definitely a possibility, but don’t forget about what happens after a network is compromised. The purpose of the hack tips series is to go beyond the hack to obtain domain admin or enterprise admin. Getting EA or DA does not always properly convey the impact to management as it may be missing that "so what" factor. Furthermore, good adversaries will leverage their access to attack other critical components such as the network infrastructure, mobile platforms, etc.--so we shouldn't forget about them just because they are behind the perimeter firewall. Happy Hacking. This is not a "hack". I can hack any server and application that i have permissions to - this is a joke. I'm sorry that you feel that it is not a hack. The challenge was to go from a compromised host (not necessarily the Good Server) to provisioning a phone without anyone noticing. Thus, we never had permission to log into the server or the application, we had to gain that.